Next time you swear on Twitter, or post that drunken photo, just remember that future employers are watching – and it could cost you a job. One in five employers says they have rejected a candidate after looking at what they’ve been getting up to online. 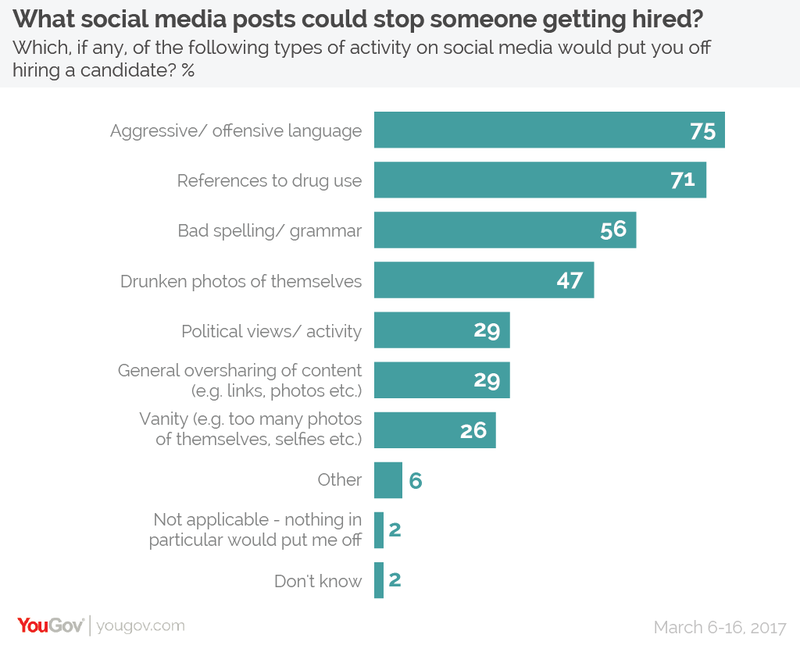 Although most people are aware of the pitfalls of social media, the number of organizations rejecting applicants suggests there are people who still fail to think before they post. What are employers looking out for? Aggressive or offensive language is the most off-putting social media activity. Three-quarters of employers said this could prevent someone getting a job. Reference to drug-taking follows not far behind. There’s a surprise in third place, as bad spelling or grammar is named by more than half as off-putting. In fact, poor spelling and grammar is more damaging to a candidate’s reputation than drunken photos. Large organizations are more likely to reject applicants, and they’re also more likely to do a background search on them, found the YouGov research. 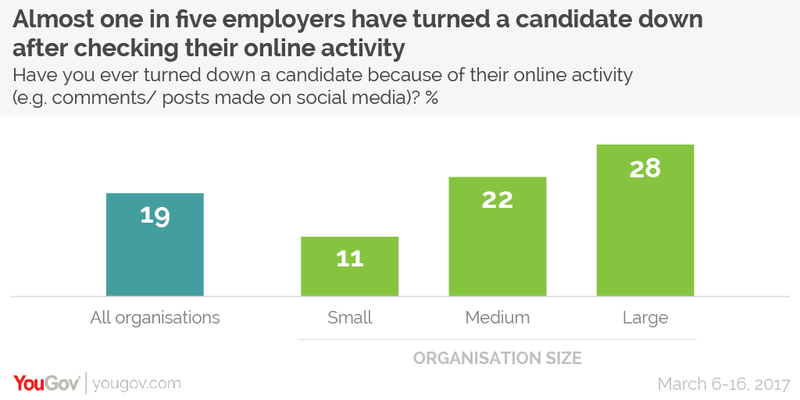 More than a quarter of large businesses have turned down a candidate on the grounds of what they discover online. The figure falls to 1 in 10 among smaller companies. At large organizations, only 1 in 5 says they don’t check applicants’ feeds. This rises to 2 in 5 at smaller businesses. More than 2,000 business managers were surveyed on their decisions when hiring new employees. The business networking site LinkedIn is the most frequently checked platform. Half of respondents said they search for candidates’ profiles. 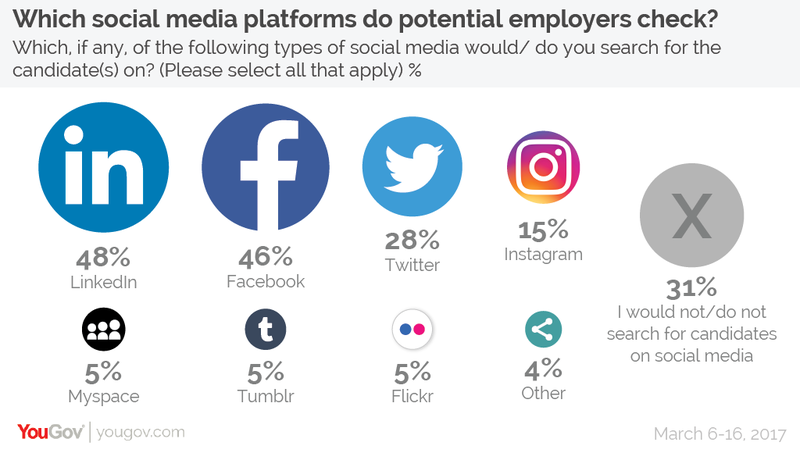 Nearly 1 in 5 employers has fired a current employee because of something they’ve posted on social media, according to a separate study. The survey, by CareerBuilder, highlights the risk of ill-advised activity on social media. “It’s important to keep you personal brand appropriate and make sure [what you post is] something you’d feel comfortable with your employer seeing,” Rosemary Haefner, chief HR officer at CareerBuilder, told CNBC. There’s a debate about whether employers should monitor employee activity on social media, though. Some employees might feel it’s an invasion of their privacy, whereas employers might counter that all the information is in the public domain.